HowToRepairGuide.com: Front wheel hub assembly Diagram and replacing procedure? 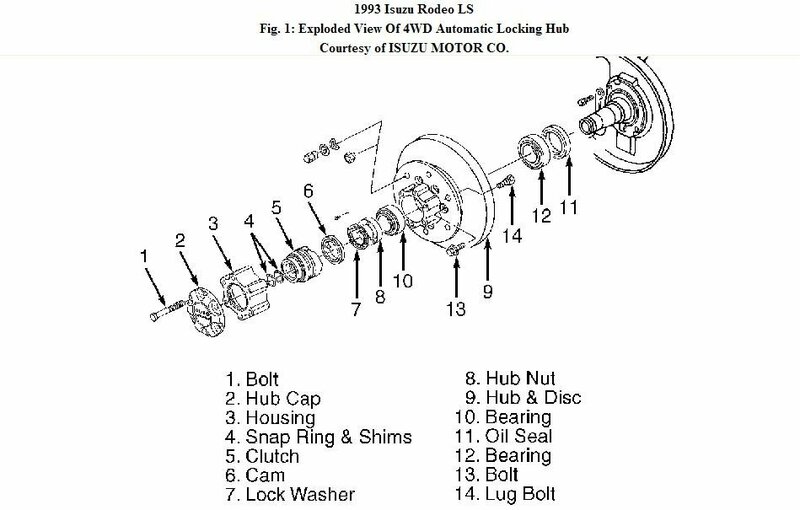 Front wheel hub assembly Diagram and replacing procedure? In this case the customer is having Isuzu Rodeo car model. it is 4wd and it has auto locking hubs. He need replacing info for front wheel hub assembly. 1. Place transfer case lever in 2H position. Move vehicle back and forth approximately 3 feet or more. Raise and support vehicle. Remove wheel and brake caliper. Wire caliper aside. Remove locking hub bolts. 2. Remove housing assembly. Remove snap ring, shim(s) and drive clutch assembly. Remove inner cam and lock washer. Remove hub nut with Wrench (J-36827). Remove hub and rotor assembly. Mark hub and rotor relation if they are to be separated. 1. Ensure transfer case lever is in 2H position. Ensure hub flange, lock washer and axle splines are clean. Install inner cam so cam keyway aligns with steering knuckle groove. 2. Using plastic hammer, lightly tap inner cam to ensure cam is seated against lock washer. Ensure cam gear faces outward. Raise lower control arm until axle shaft is horizontal. Install Gauge (J- 36836 and J-36835-2) over end of axle shaft until gauge contacts lock washer. Using feeler gauge, measure clearance between gauge and snap ring groove. If clearance exceeds .004" (.10 mm), install shims. 3. Remove gauge. DO NOT remove inner cam. Apply multipurpose grease to axle shaft splines. Apply grease to proper areas of drive clutch assembly and housing. Apply proper amount of grease to designated areas. 4. Align cutout area of drive clutch assembly with concave area of inner cam. Engage cam teeth of drive clutch assembly with inner cam teeth by rotating axle shaft. CAUTION: Always install NEW snap ring on axle shaft. 5. Place snap ring installer in center hole of axle shaft. Hit snap ring installer by hand while pulling axle shaft outward. DO NOT use hammer to install snap ring. Force snap ring into position and ensure it is fully seated. 6. 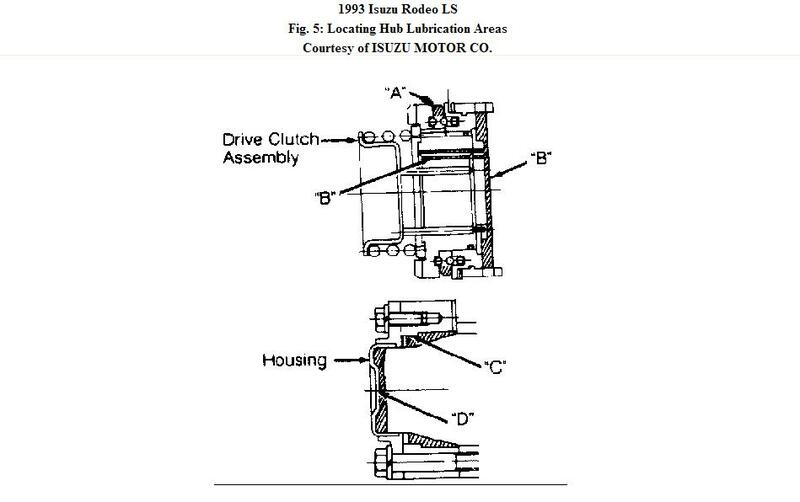 Apply Loctite (515) to both sides of housing assembly and flange surface of driven clutch assembly. Install housing-to-hub bolts and tighten to 43 ft. lbs. (58 N.m). Install brake caliper and wheel. Tighten caliper bolts and wheel lug nuts to specification. 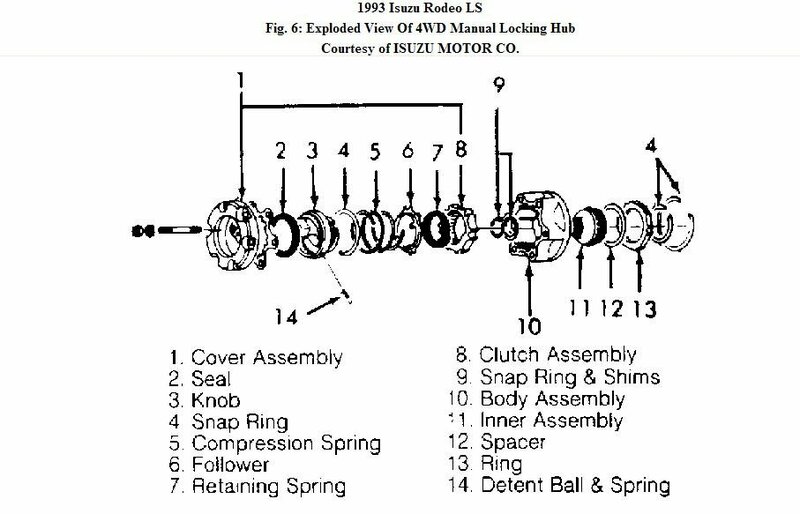 This is a manual hub. How to replace Wheel Assembly on Acura Car Models? How to replace wheel bearing and steering knuckle on Mitsubishi car? Pankaj International is committed developing, manufacturing, delivering and servicing quality products. Our goal is to continuously improve our products and services in order to satisfy the needs of our customers before, during and after sales. In each of our products category our quality is amongst the best. We use the best quality of raw materials that are and subjected to stringent standards as per required specification.